Includes car rental, hotel accommodations, tours and more. *Price is total per person and both price and availability are subject to change and are not guaranteed until completed through the booking process. take the roads less traveled and explore the sights and secrets of Ireland. Today you embark on your journey to Ireland! Pack your jacket and a camera as you set off for the Emerald Isle! Upon arrival, you will pick up your 2 rental cars and drive to your hotel. We have arranged for you to immediately check in and refresh in your rooms. Within walking distance of your hotel, are many shops and even some castles and other grounds to explore. We would suggest, after freshening up in your hotel room, or grabbing some breakfast/lunch, making your way to Bunratty Castle. This evening, you have tickets to an Irish Night filled with song, dance and food! The grounds have much to explore, though, so taking your time earlier in the day to wander about at Bunratty Castle, may be enjoyable! You'll stay in Limerick tonight before traveling south. You'll stay in the Ballyseede Castle for 3 nights as you explore the area. After breakfast, drive south on the Ring of Kerry to Portmagee. 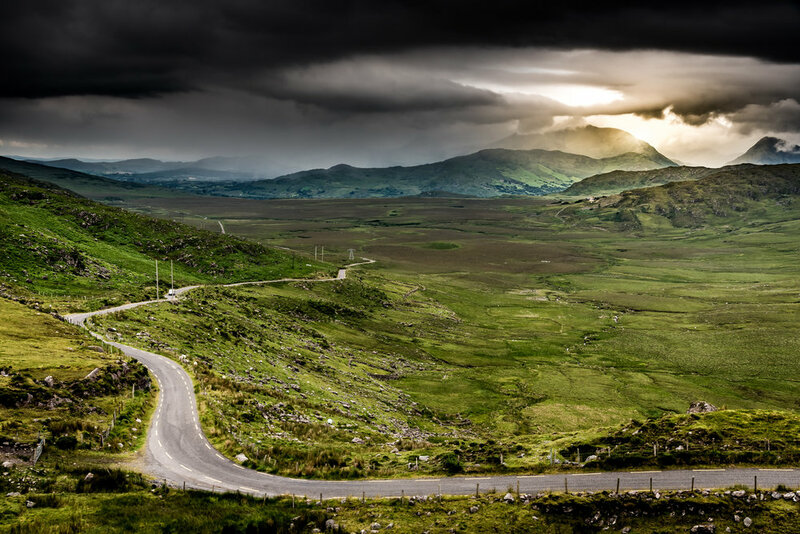 As you cruise along the Atlantic Coast on this spectacular mountain road through the towns of Kells, Derrynane, and Glenbeigh, you’ll find a number of impressive sights, with various stopping points and photo opportunities. From Ross Castle and Muckross House to Torc Waterfall, Bog Village, and the glacial valley of the Gap of Dunloe, you’ll want to keep your eyes peeled and your camera out. The ring also passes the golden beaches of Inch Beach, the Lakes of Killarney, the Macgillycuddy’s Reeks mountains, Ladies View, and Dingle Bay looking out to the Dingle Peninsula. The coastal side of the loop offers a taste of the Wild Atlantic Way, and in County Kerry’s Waterville, visitors tend to stop for photos with the waterfront Charlie Chaplin statue. As with many ring roads, there is little room to pass at some points. It’s good to note that all tour buses travel counterclockwise from Killarney and that self-driving travelers can head clockwise for less traffic. At the bottom of the Ring of Kerry, you'll take a detour onto the lesser known, Skellig Ring. Skellig Ring is a predominantly coastal road that offers panoramic views of its namesake, the Skellig rocks. While it might be the Ring of Kerry’s lesser sister, it certainly is far more impressive. From the highest point of the road you can climb the hill on the seaward side of the saddle in twenty minutes or so for the most magnificent views out to the Skellig Islands, across to the Dingle Peninsula and the Blaskets, and inland to the Iveragh Mountains. Take Skellig Ring to Portmagee where you will board a ferry to Skellig Michael. Sail on a grand adventure to the majestic Skellig Islands, which lie 7 miles off the west coast or Ireland. The earliest reference in history to the Skellig Islands dates back to 600AD. During the time of the Penal Laws, Skellig Michael and Little Skellig became a haven for many Catholics whose beliefs and rights were being suppressed. The largest of the Skelligs is Skellig Michael (Sceilg Mhichil) and was home to one of the earliest monastic settlements in Ireland. The monks of St. Fionan's monastery led simple lives and lived in stone, beehive shaped huts. They would descend the 670 steps early every morning and fish for the morning's breakfast and would spend the rest of the day praying in the church, tending to their gardens and studying. The huts, which are round on the outside and rectangular on the inside, were carefully built so that no drop of rain ever entered between the stones. Skellig Michael also features birdlife in abundance - puffins, guillemots, kittiwakes to name a few all call these islands home throughout the year. You may also just encounter whales, dolphins, sunfish and even basking sharks roaming the surrounding waters. Hidden away on Ireland’s southwestern coast, Dingle is at the heart of the Dingle Peninsula, and a popular starting point for both the Dingle Way long-distance hiking trail and the Slea Head driving route, which loops around the scenic headland, passing by Europe’s westernmost point at Slea Head. The drive passes through the village of Ventry which is on the coast and has a good beach for swimming and water sports. Then the drive winds through cliffs and offers views of the Atlantic Ocean as it nears Slea Head. Scenes from Ryan's Daughter and Far and Away were filmed near here. The Slea Head Drive continues through wild landscapes and several villages. One of the highlights is the Gallarus Oratory, the best preserved early Christian church in Ireland. The drive also passes through fishing villages and mountainous regions, including Mount Brandon, the second highest mountain in Ireland. The Connor Pass is an absolute highlight that cannot be missed. It starts just outside the town of Dingle and ends on the other side of the peninsula near the village Castlegregory. It is Ireland's highest mountain pass. It is a narrow, twisting road surrounded by sharp drops and lakes. As such, buses are prohibited from driving this road. Just off the very westernmost point on the peninsula you will find the Blasket Islands. Until the 1950s these islands were inhabited and from Dunquin, on the mainland, you can still see the remains of the main village on the Great Blasket island. Many of the old inhabitants became famous writers and poets and the Blasket Centre has a fascinating exhibition on the literary heritage of the islands. A large part of the peninsula is designated as a so called "Gaeltacht". This means the Irish language is the primary language spoken here. Road signs, for example, are all in Irish language. Check out of your castle this morning and take off on the road to see Co. Clare. Start your day by exploring The Burren, one of Ireland’s most unique and photogenic landscapes. Stretching over 160 square km, the Burren, derived from the Gaelic word Boireann meaning ‘rocky place’, is one of the most visited attractions in the Shannon region. Aptly named, the karst topography is characterized by its unusual limestone formations, naturally sculpted through acidic erosion over thousands of years. The natural landscape is an otherworldly terrain - a giant jigsaw of rocks, made up of grikes (fissures) and clints (isolated rocks jutting from the surface), with pockets of lush greenery poking between the expanses of bare rock. Then head towards the Cliffs of Moher. Towering 702 feet above the Atlantic Ocean at their highest point and stretching for five miles along the water, the world-famous Cliffs of Moher define the rugged west coast of Ireland. They are one of the most popular tourist attractions in Ireland. Once at the cliffs, you can wander a number of winding coastal trails and pathways, capture photos of the dramatic scenery, and walk out to peer over cliff edges at the waves below. The onsite underground Visitor Centre features educational exhibits and a number of arts and crafts gift shops, while the viewing platform atop the historical O’Brien’s Tower provides stellar views stretching west to the Aran Islands, north to Galway, and out along the Atlantic Coast. After exploring the Cliffs of Mohr to your liking, drive to Dromoland Castle, where you'll stay for the next 2 nights. The Aran Islands are one of Ireland’s most unique destinations, but most visitors only admire them from afar. Today, you'll take a round-trip ferry from Doolin to Inis Mór to give you the whole day to explore independently and visit sights such as Dun Aengus, the Black Fort, the Seven Churches, and Clochan na Carraige. Make your own way to Doolin Pier in time for a 10am departure. Set sail on the around 1-hour and 15-minute journey to Inis Mór, the largest of the Aran Islands, and enjoy spectacular views of Galway Bay and the Cliffs of Moher as you cruise out across the Atlantic. On arrival in Kilronan Harbour, you’ll have the entire day to explore the island at your own pace. Perhaps rent a bike, or ride a horse around the island, and take in sights such as Dún Aonghasa (Dun Aengus), the Aran Heritage Centre, Dún Duchathair (The Black Fort), Na Seacht dTeampaill (The Seven Churches), Teaghlach Einne (House of St. Enda), and Clochan na Carraige. You could also shop for the islands’ famous Aran Sweaters at the Aran Sweater Market in Kilronan, spot wildlife such as seals and sea birds along the coastal cliffs, and tuck into a typical Irish lunch at one of the harbor’s many pubs, restaurants and cafés. Make your way back to Kilronan Harbour in time for the return ferry at 4pm sharp. Your tour ends back at Doolin Pier around 5.30pm. You'll want to stay in Doolin for dinner, stop by Fitzpatrick's Pub , the local seafood is particularly good here! Then visit one (or more) of the village’s three historic pubs, Gus O’Connor’s, Mcdermott’s and Mcgann’s. All host nightly music sessions, where you can hear Gaelic poetry set to music and admire the soulful timbre of traditional instruments like Celtic harps, tin whistles, fiddles and Irish flutes. Musicians from all over the globe visit Doolin in search of the genre’s roots, and a number of events throughout the year bring together local and international musicians for impromptu jam sessions. With allegedly more musicians per square mile in this county than anywhere in the world, it’s unsurprising that this small fishing village is hailed as the capital of Irish folk music. Musical traditions still reign strong today, and those looking for an authentic taste of traditional Irish music won’t have to look far in Doolin. This morning, you'll check out of your castle and drive north to Galway, where you will stay in your central hotel for the next 2 nights. 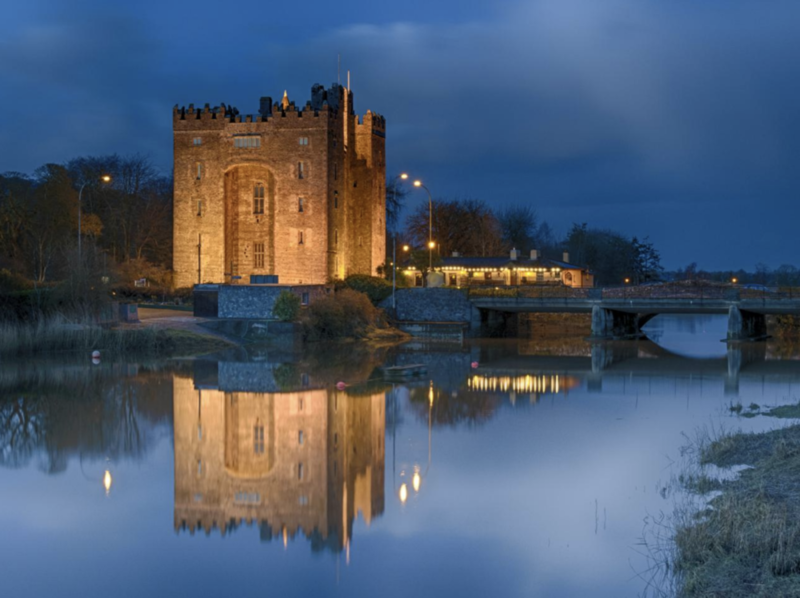 Known as the ˜City of the Tribes", the vibrant city of Galway has plenty to keep visitors entertained, with awe-inspiring architecture, a riotous nightlife and some of Ireland's principal attractions right on its doorstep. In fact, one of those tribes that Galway is known for is the Joyce Family, who gave us the Claddagh ring! Explore the Claddagh area on a tour (food, history, whiskey), or on your own! Be sure to visit the Galway Cathedral, though! The cathedral’s copper domed roof, visible for miles around, has become one of Galway’s most beloved landmarks, but it’s the resplendent interiors that visitors find most impressive. An eclectic blend of artistic and ceremonial decorations, the lavish cathedral hall draws inspiration from a myriad of architectural styles including gothic-style rose windows by George Campbell, Romanesque stone carvings and a Renaissance-style Crucifixion mosaic by Patrick Pollen. Above all though, it’s an incredible achievement of artistry, from the intricate woodcarvings to the vast wall paintings, seamlessly blending generations of Irish art and design styles. If you feel like visiting another castle, be sure to see Dunguaire Castle! Sitting on an outcrop jutting into Galway Bay, the 16th-century Dunguaire Castle appears like a fairy-tale vision to drivers traversing the coastal road, prompting many to pull over and reach for a camera. The site housed prominent local clans for centuries before famous Irish surgeon, poet, and playwright Oliver St. John Gogarty bought it in 1924. He then turned it into a hangout for Ireland's literary elite, including Lady Gregory, W.B. Yeats, Sean O'Casey, and George Bernard Shaw. Today, most travelers admire the castle from afar, though some do venture inside. You can explore the castle's modest interior and climb to the top of the 75-foot (22-meter) tower for daytime views over Galway Bay, and in the evening, if you’d like (extra cost), you can enjoy a medieval banquet, which includes a 4-course candlelit dinner complete with Celtic music, mead, and storytelling. Massive, flamboyantly turreted, Ashford is the very picture of a romantic Irish castle. This famed mock-Gothic baronial showpiece, dating from the 13th century, and rebuilt in 1870 for the Guinness family, has been wowing visitors like President Reagan, John Travolta, Brad Pitt, and Pierce Brosnan—who got married here—ever since. Nearly bigger than the entire neighboring village of Cong, it is strong on luxury and service, yet maintains a relaxed atmosphere in which guests of all ages feel totally at ease. Kids immediately associate the castle with Hogwarts... and better yet, you don't have to stay here to see the grounds! While a small fee will allow you entrance to the grounds and gardens, lunch reservations will allow you a sneak peak inside the castle (closed to guests not staying the night). Your final stop of the day is at the magical 19th century limestone and marble Kylemore Abbey. Tucked in the shadows of the mighty Seven Pins Mountain range, Kylemore Abbey cuts a striking figure against its majestic backdrop. A Benedictine monastery founded in 1853, the Abbey took seven years to build and remains in use today as an all girls’ school governed by Benedictine Nuns - the only Benedictine Community in Ireland - as well as opening its grounds to tourists. With its idyllic surroundings encircled by woodlands and postcard-worthy façade fronted by a glistening lake that perfectly reflects the grand building, Kylemore Abbey has fast become one of County Galway’s most popular iconic sights. While parts of the 1000-acre estate remain closed to the public, visitors can tour many of the most impressive sights, including the magnificent Gothic Chapel and the Abbey’s beautifully restored main hall. The 6-acre walled Victorian Gardens are another highlight, where pretty walkways, 19th-century flowerbeds and a series of greenhouses are divided by a gurgling stream and enclosed by a brick and limestone wall. The onsite crafts shop and café, where the nuns serve up home-cooked food, are also popular, with the teahouse terrace offering wonderful views over the nearby Connemara National Park. Today you will bid farewell to Ireland. 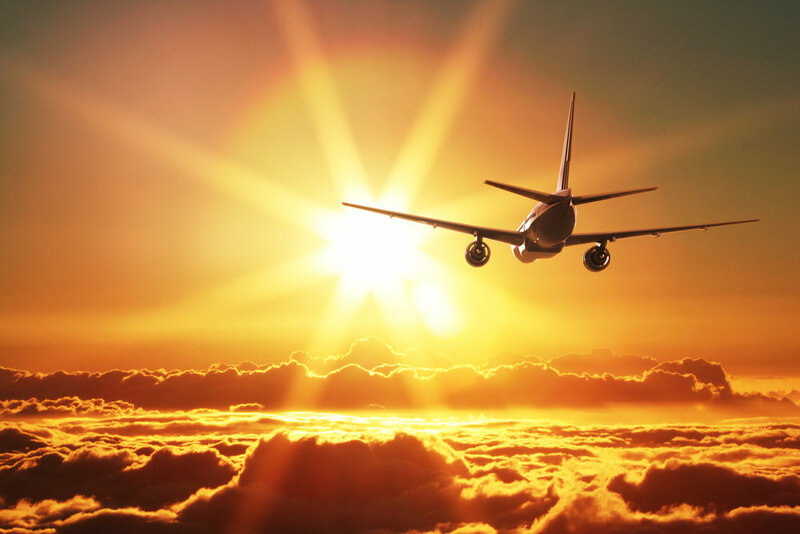 You'll return your rental car at the Shannon airport and board your flight home. The driver must present a valid driver's license and credit card in their name upon pick-up. The credit card is required as a deposit when renting any vehicle. The deposit amount is held by the car rental company. Please ensure sufficient funds are available on the card. *Car rental is payable onsite only (estimated as $433,38/car) - Prepare to put down a deposit and pay for their insurance— this is mandatory in Ireland. *payment schedule does not include insurance costs. Insurance is due within 10 days initial payment. We recommend registering and making payments as quickly as possible. If you choose to wait, you can still book this trip; however, the price may increase and accommodations may change.